Don’t throw that computer in the trash – help the environment and bring it to us! Desktop recycling is $10 per unit. Please do not leave items outside our store after hours, if we aren’t there to accept it – our cleaning service charges us $100 per offense. You can also rest assured that your data is safe with us. Our recycling process permanently destroys any and all user data on any electronic device. 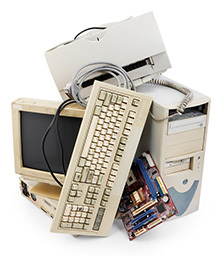 Bring by your old computers, laptops and hard drives and let us help you dispose of them the right way.